Visual difference between the various Mercedes C-class variants is difficult unless you happen to read the badge at the rear. Also the Avantgarde trims are easier to recognize with their wide spacing in the central grille and the 3 pointed star descending down to the middle of the grille. Elegant lines define this car. No hint of sportiness or anything. It is as good as any Mercedes that you can buy off the shelf. Subtle and stately are the terms that would aptly describe this car. The 225/45 R17 tyres also are scream the same subdued things that the other features in the exteriors talk about. Wonder why none of the manufacturers offer tasty looking alloy wheels. All offer the same boring looking design. The wing mirrors also have two air deflectors which increase the aerodynamic efficiency. The rear end is also nicely shaped. No gimmicks here except for the LED stop lamps and that fat tail pipe. The tail pipe somehow brings in some of the sportiness that this car is known for. Cut to the interiors, there is nothing different than the other Mercedes C-class cars. You get the same leather seats all around and surrounding wooden trim for the door handles part. The high quality that Mercedes were known for earlier has now returned. Took some time to actually fit in the C-class’s driver seat but the seat adjustments were very easy. The instrument cluster is also innovative and a far cry from what BMW offers. BMW’s instrument panel looks good in the night whereas the Mercedes one looks good in day light. The music system now doesn’t have the Harmon Kardon Logic 7 system and nor is there any provision for a USB port. Cubby holes abound for storing all the knip knacks. My personal opinion is that the BMW and Audi’s interiors feel much more luxurious than the gray option that Mercedes gives. Circa to the rear seat, not comfortable as the Audi or even BMW. Even though the C-class looks like it has grown over its predecessor, it doesn’t feel so the same on the inside. For me, it was more like the seats of a Hyundai Santro. The knees brushing the front seats, even at half travel. Boot space is comparable with the rest in its class and the 60:40 split seat arrangement adds to the convenience. There is a light in the boot loading area and this helps while loading the car in dark areas. As for the ride and handling package, the Mercedes C200 CGI in India is right up there with the rest of its ilk. As a special package, it gets the Agility Control suspension. This suspension adjusts itself according to the driving conditions and demands of the driver. The steering wheel has been also blessed with this package. However I did note that this steering wheel felt a bit artificial in its operation. Most of the steering commands were executed without even a whimper by this special steering wheel. Ride quality for Mercedes has been always superlative and the new suspension package brings it to the forth. Moreover, the noise insulation is excellent and even the engine doesn’t let its whimper crawl into the cabin. Its only at speeds in excess of 140 kmph that some wind noise creeps in. This thing, I guess is even common to the E63 AMG which we had sampled in the StarDrive event. Coming to the engine, which is the star in this entire car. For starters, this car like a diesel direct injection one uses piezo electric injectors. Unlike other fuel injectors which can spray only once during a combustion cycle, this one can actually spray multiple times. The delivery pattern for the same is also very consistent and hence results in a fine fuel mist. You can’t have your cake and eat it too. But with the Mercedes C200 CGI in India, you can actually do it. Replacing the supercharger from the earlier Kompressor variant is an all new supercharger. The 1796 cc engine now makes 186 Ps of maximum power at 5600 rpm whereas the peak torque of 285 Nm comes in between 2400-4000 rpm. In comparison, the older Kompressor model made 4% less power and 45 Nm of less torque at a higher rpm. Mated to this engine is a 5 speed automatic transmission which is very quick for the upshift but for the downshifts, it seems a bit lethargic. Nevertheless, the car raced from 0-100 kmph in only 8.3 seconds and its top speed is held at 190 kmph. This is a test drive and how could I bring you the performance figures would be your next question. Well, this car is surprisingly fast and before I could realize it, I had already climbed to speeds of 120 kmph. So the 0-100 timing could be tapped in. For the top speed, this was a hint by one of my friends whose boss owns this car. As far as the brakes are concerned, they are right upto the mark with discs in front and rear. The usual ABS, EBD and ESP are present to stop the car in emergency situations. The newest feature amongst Mercedes cars, Pre Safe has been installed in this car. This system primarily works on the fact that upon sensing a collision, the sun roof as well as windows (if they are open) close on their own accord. Moreover, the seat belts also have pretensioners which tighten their grip around you. The brakes are also adaptive units whereas there are 8 air bags in all nooks and crannies of this car. Fuel efficiency is also said to be on the higher side with an ARAI certified 11.47 kmpl. Remember, I mentioned that with this car, you can have your cake and eat it too. The car finally returned, here is the chance to dissect its pros and cons. First, this car is a huge image booster and especially for those looking for an entry into the 3 pointed star club. The equipment on offer is more than what a similarly priced BMW 320i would give, it has got the go to match the show outside, inspite of been performance happy, it is surprisingly fuel efficient as well. The cons now are that its got less space inside, is pricier than rivals, servicing costs are monstrous and some of the features from the earlier Kompressor variant have been deleted. Mercedes Benz India website shows only three models in its entire lineup for the C-Class in India. Those are the C200 CGI BlueEfficiency, C250 CDI BlueEfficiency and the C250. Earlier there was the Mercedes Benz C 200 Compressor Elegance MT, Mercedes Benz C 200 Compressor Elegance AT, Mercedes Benz C 220 CDI Elegance MT and the Mercedes Benz C 220 CDI Elegance AT. Apart from them, there still exists the Mercedes Benz C63 AMG. The Mercedes C class price in India starts from Rs 26.12 lakhs and ends at Rs 35.90 lakhs. All these prices are ex-show room, Mumbai. Now for some cake eating. I bought the C 200 CGI in the very month of its launch and was the first few CGI cars delivered. The C 200 CGI has been a big disappointment from the start. The allignment was a big problem and the car swirls to the left all the time. The engine is very non responsive and there is a terrible lag and the pick up is very slow. Mileage is no where near to what was promised verbally of course. I am one disappointed customer. I think the C200 CGI is no better or different than the KOMPRESSOR. You need to give a big push to accelarate. 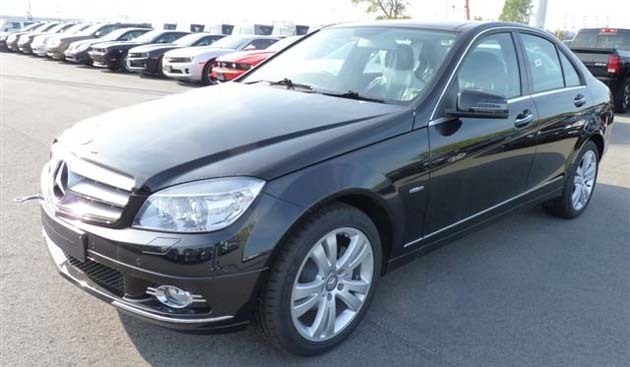 At this price you dont expect this out of a mercedes benz. I made a big mistake to buy the petrol instead of the deisel. I am almost ready to sell it now. Be careful before you buy one.